At 11 am today, Mad Fox Brewing Company opened its doors to the public for the first time, and Falls Church, Virginia, a city of 11,000 or so, situated 8 miles east of Washington, D.C., became home to its first ever brewpub. Mad Fox is a collaborative project of Brewmaster/CEO Bill Madden, a long time doyen of the Washington, D.C. brewing establishment and principal investor Rick Garvin, himself a national homebrew judge and self-professed 'foodie.' Joining them is coterie of area investors, who believed enough in Madden and the project to invest despite an economic downturn. I was fortunate enough to get a preview. 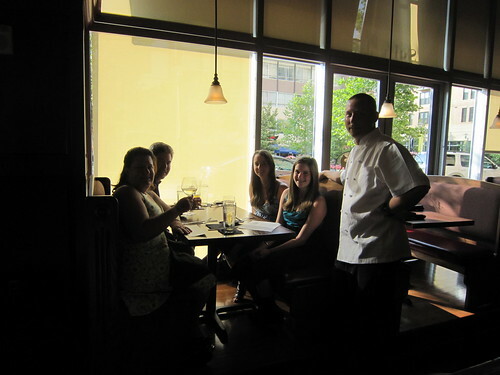 Staff training is one thing, but operating a restaurant when customers are present is another. Thus, Friday evening past, investors, wine salesmen, friends, and members of the press were invited to enjoy the food and beers (and some wine and cocktails) and offer critiques. Beer blogging occasionally offers benefits. Joining me were Nick Anderson of The Beermonger and Andrew Nations of dcbeer.com, and their significant others. The two had not met each other personally but immediately recognized each other's Twitter handles: @The-Beermonger and @drinkrealbeer, respectively. It's a brave new Web 2.0 world we live in. The entrance is not on the Broad Street side, but along the interior courtyard. There are many glass doors, none marked "open here." Look for the one in the center, marked "Suite I." At some point soon, the restaurant will have outdoor seating as well. Parking is not an issue: there is an underground garage in the complex. Open the door, then open the doors of the inside foyer, and then ... there they are! Serving as function and aesthetic, six stainless steel serving tanks sit immediately behind the host stand, reminding the customer that this is a brewery as well as a restaurant. Each holds 13,720 pints of beer. The tin ceiling overhead is actually cleverly disguised acoustic tiles. The high ceilings and lots of wood of the 9,000 + square foot interior are well-lit by sunlight through the plate-glass windows ringing the establishemnt and by diffused light from attractive overhead fixtures. The dining room is to the left and the bar area is to the right. The very back wall of the dining area is now empty, but it will eventually be a floor-to-ceiling shelf holding wooden barrels of aging beers. Diners can see the brewery behind tall windows in the dining room. In addition to a 15-barrel brewhouse, there are several 30-barrel fermenters, double jacketed so that both 15-barrel and 30-barrel batches can be brewed. If a tank is needed to ferment or serve a beer, the remaining finished beer will be racked into kegs. He'll need to do that, because he plans to have at least 12 to 15 beers on tap at any given time. The long bar seats some 30+ customers, and the bar area can accommodate many more, with several bar tables, as well as booths and bar stools along the windows. A service area sits at the end of the bar, not for staff, but at which customers, not sitting at the bar, can order. Wrapped past the bar, and parallel with Broad Street, is a narrow room with long tables, and a fireplace at the rear wall. In Germany, a communal table like this is referred to as Stammtisch. This room can also be used for private parties and special events. Beer dinners, Madden promises! There are 30 taps, split between two towers. For the mock opening, Bill was pouring four: his 'signature' Kölsch (a 'lagered' ale, previous iterations of which have garnered Madden medals) a 6.5% alcohol-by-volume (abv) American Pale Ale (malty and toasty, with a hefty citrusy aroma and finish), a 6% abv Porter (dark reddish-brown, with characters of bakers chocolate and dark fruit), and a 6% abv Saison (orange-hued, demi-dry, and earthy). Madden has long been an advocate for cask ale, and his new brewpub will be a showcase for it. Six firkins (10.8-gallon casks) rest in refrigerated coolers under the bar, the temperature set in the low 50s °F, which some refer to as traditional English cellar temperature (but which is definitely not room temperature). A row of hand-operated 'beer engines' sit above, used to handpump the beer up to the bar. Madden will have four cask ales tapped at any one time. The other two casks will sit undisturbed in the coolers for several days, allowing the beer to 'come into condition': natural carbonation created, and proteins and yeast in the unfiltered beer settled out of solution. He'll serve no beer before its time! Beer to go —filled into 2-liter glass 'growlers'— will be offered, although not for cask ale. Bill is a stickler for details. Nothing other than beer can be poured into his "beer-clean" glasses, (He has different shaped glassware for different styles.) and no chemical sanitizers can be applied. The glasses are cleaned and sanitized in a high temperature dishwasher, separate from the plates, utensils, and dishes in the kitchen. That evening, Pale Ale, Porter, and an 80-Shilling Ale were offered in cask. The last —dark red, caramelly, but not sweet- think of as 5.2% abv version of the much bigger Wee Heavy Scotch Ale, that is yet to finish its fermentation, and for which Madden has won several awards. Mad Fox scored quite a coup in attracting their chef, Russel Cunningham. He has built a reputation among Washington, D.C. area foodies, having previously 'cheffed' at such places as Dupont Grill and Agraria. Cunningham and Madden refer to menu as from a "scratch kitchen". They source many of the ingredients locally, use food in-season, and produce many items in-house. The menu for the 'mock' service was quite extensive, if not the complete menu that will be offered once Mad Fox opens today.. We ordered several appetizers for the table including house-made onion rings, house-made fried pickles (called Frickles), Prince Edward island (P.E.I.) mussels prepared 'Bloody Mary': vodka-tomato sauce with fresh horseradish, and a Tuna and Avocado Salad over shredded cabbage (the tuna was beautifully rare). As much as we enjoyed our choices, we could not help overhearing the "oohing" over the Virginia Pork Belly at other tables: "slow roasted for 12 hours, glazed with molasses and local honey," read the menu. For our main course, we skipped all but one of the entrées: Shrimp & Grits (Cajun-spiced sautéed jumbo shrimp, served with smoked Gouda grits, and braised greens). This was not because the choices didn't sound promising -NY Strip Au Poivre, Grilled Lamb Chops, Slow-smoked 'St. Louis' Ribs, Pan-Seared Sea Bass, to name but a few- but because the restaurant touts the pizza as the star of the show. Mad Fox has two pizza ovens in its kitchen: one, a New York-style convection oven (a chewy and thin crust for holding more sauce) and the other, a wood-burning Neapolitan-style oven ("High-moisture fresh mozzarella and low-gluten flour). the Carbonara Pizza (with a cooked egg on top), the aptly named Garlic Pig Pizza (artisinal pepperoni and bacon), and the Salami & Goat Cheese Pizza (without the salami for me, a vegetarian: a demonstration of the kitchen's versatility to adapt). All were prepared Neapolitan-style: a nice level of char on the underside of the crusts, and toppings cooked just-right. Choices for vegetarian fare were more limited. There were salads and gazpacho soup. If dairy, there were the pizzas, of course. Specifically vegetarian, there was a house-made Black Bean Burger, The Veg —a sandwich of roasted red peppers, grilled eggplant, etc.— and a Crispy Tofu entrée with sautéed spinach, wild mushrooms, Israeli couscous, and and carrot-apple broth. (None, except for the pizza, were sampled that evening.) More are promised. Go for the food, stay for the beer. Go for the beer, and stay for the food. Mad Fox should be a hit as a brewery and a restaurant. Lunch will be served and there will be continuous service throughout the day into the evening for dinner. The address is 444 W. Broad Street [just off the intersection of Broad & Pennsylvania], Falls Church, Va. 22046. The telephone number is (703) 942-6840. Metro access is a mile away at the East Falls Church station on the Orange line. The website dcbeer has a useful list of Metro buses that will take you there. Keep in mind that the routes stop earlier than bar hours! You might not have a return bus trip after 10pm. The website at www.madfoxbrewingcompany.com is still under construction. Better to follow Mr. Madden's blog at maddbrewer.com or the restaurant blog at madfoxbrewing.wordpress.com. More photos, including construction: here. Read a pre-opening write-up at dcbeer.com: here. Read an interview with Bill Madden: here. Click for more blog posts about Bill Madden and Mad Fox. CAVEAT LECTOR: As a salesman for northern Virginia beer/wine distibutor Select Wines, Inc., I sell wines to Mad Fox. Thanks Much for the updates! Great place.